Held on the solstice, this Spire concert, held at a church in the east end of London under the banner of the Spitalfields Music Summer Festival was the 13th in an on-going series of events organised by Touch label boss Mike Harding, in which he hopes to forge a rapprochement between the electronic music with which his label is closely identified and humanistic analog music. A programme of variously composed and improvised music, Spire 13 bought two artists intimately associated with Touch, BJ Nilsen (electronics) and Philip Jeck (turntables & samplers), together with tenor John Beaumont, pianist/organist Charles Matthews, and organist/composer Marcus Davidson. The performances were prefaced by a relaxed but illuminating discussion between organist Charles Mathews, Touch boss Mike Harding and Scott McMillan of The Liminal. 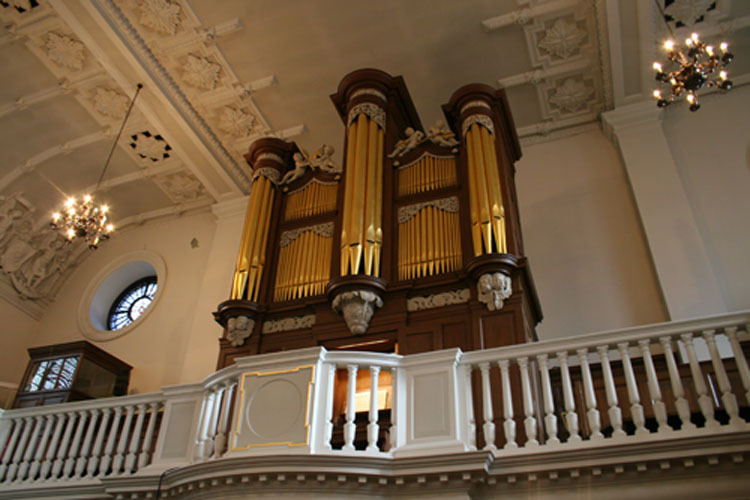 Matthews revealed some of the peculiarities of the St Botolph organ, which may be the oldest church organ in use in England. Built in c. 1705, and restored in 2006, the organ has been restored to its original tuning, and so to our ears might sound out of tune. In addition, it is “for historical reasons” missing one of its lowest pedal notes, to avoid which Matthews had to re-score one piece in a higher key. The audience were encouraged to move around during the performance, to uncover the variously unique acoustic spaces within the church. The performances began with Charles Matthews at the piano performing the limpid “Lento” from 20th century Maltese composer Charles Camilleri’s Sonata Semplice, which gently hinted at the writer’s interests in folk music and improvisation. Matthews moved to the organ to perform JS Bach’s “Komm, Heiliger Geist” and then to accompany John Beaumont’s recital of three lyrics by Renaissance organist/composer William Byrd: “O God give ear”, “My soul oppressed with care and grief”, and “How shall a young man prone to ill”. These examples of populist religious music attuned the audience’s ears to the unique acoustic properties of St Botolphs while underlining its history as a sacred space. The music of Marcus Davidson was well chosen to connect such liturgical music to the signature Touch aesthetic. A new composition “The Conscious Sky” (for piano & tape) combined piano playing with an expressive tape collage of penetrating high-pitched overtone (throat) singing (which echoed a temporary sound installation in the crypt), deep sarod glissandi and mechanical drone. It was an interesting but (on first hearing) perhaps not satisfactorily integrated work; certainly his next piece surpassed it. “The Passing” (for organ and tape, apparently includes recordings from space) was (alongside the Ligeti which followed it) one of the night’s twin highlights. The granular pre-recorded audio of synth tones and ghostly voicings perfectly complemented glowering swells of organ ambience, which became almost proggy as the piece built to a crescendo inescapably inflected with the liturgical resonance of a threnody. The richness of the sounds at play here was as mesmerising as the evolution of the performance was powerfully compulsive. You can hear it for yourself on Davidson’s website. Davidson relinquished the organ to Matthews once more for a recital of György Ligeti’s 1962 Study for Organ no 1, “Harmonies”. The music of Ligeti seems to me particularly susceptible to the nuance of performance variables, and it was wonderful to hear the layered, ethereal tone colors and haunting glissandi that characterize this piece in such a magnificent setting. As with all of the music heard tonight, no recording could capture such tonal riches. A long duet from John Beaumont and electronic musician BJ Nilsen, married hollow drones and high-pitched whorls to the tenor’s vocals, which as he sang from the balcony above us were oddly offset and produced an appropriately choral if rather unsettling effect. Nilsen continued long after Beaumont had ceased singing, carrying ghost-traces of vox in muted bursts of static noise, much as I imagine extinct man’s audio persisting in the void of an unfeeling universe. A piece by Diana Burrell, “Lauds”, here performed by Charles Matthews on the organ and enhanced by electronics, was a nod to the composer who is Artistic Director of the Spitalfields Festival. The piece, marrying jarring organ chords to the lighter tones of a reed organ on the electronic track, had an effective structural simplicity. Sequenced here, Finzi’s Three Songs for Tenor and Piano (performed by John Beaumont), seemed jarringly, operatically asynchronous. They were followed by an interesting attempt by Davidson, Matthews and Harding to coax the organ into playing “The Eternal Chord”, described on the Touch website as “an improvised organ piece that can take anything from 8 minutes to eternity”, heard here in one of its shorter renditions. A solo set by Philip Jeck on turntables and sampler was, to concur with modular synth artist John Chantler, “kosmiche sounding”, and characteristically Jeckian in its oceanic indeterminacy, despite the bold use of vintage pop samples. To follow this long, immersive performance immediately with the clear simplicity and luminous, atemporal suspensions of Arvo Part’s “Pari Intervallo” for organ (performed by Charles Matthews) was an inspired juxtaposition. All of the artists came together for the night’s concluding “Organology” ensemble piece, in what I assume was a structurally pre-planed improvisation. I made no notes on it, but was vividly impressed that the performers had evidently paid close attention to each other’s tonalities and methods throughout the evening. Harding spoke in the introductory talk of the impossibilities of satisfactorily mediating such an event on record. Certainly, the splendid setting and acoustics of St Botolphs, the illuminating daylight that flooded it in the early evening, and the reverberant immediacy of the organ highlighting the superb acoustics all combined to make this a vividly memorable evening. I had been tempted to go instead to Cafe Oto, to see Hans-Joachim Roedelius of pioneering electronic groups Cluster and Harmonia perform a rare London show; but I can’t regret my choice. This entry was posted in Live and tagged BJ Nilsen, Charles Matthews, Diana Burrell, John Beaumont, Marcus Davidson, organ, Philip Jeck, Spire, Spitalfields Music, St Botolph without Aldgate, Touch. Bookmark the permalink.